It’s Week 2 of Nonfiction November, and Rachel poses these questions about choosing nonfiction. In my reading life, nonfiction is first about the voice, then about the topic. I’m looking for a narrative voice that I like, and usually it’s conversational and casual. Overly fussy, complicated sentences leave me cold. I think this is why I full-on love books by journalists — they know how to keep it punchy. … a book I apparently can’t stop talking about. 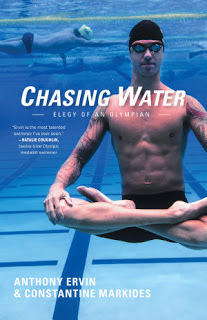 Given the topic of the book (an Olympic swimmer who practices Buddhism), the book cover is perfectly perfect. What are the nonfiction topics you can’t resist? This question has gotten me thinking about the language of nonfiction, which is something I hadn't considered in detail before. I hear your point about journalists (and as I said in my own post, overly flowery and distracting language can drive me mad), but sometimes I find that their writing is sloppy or not finely crafted enough, with mistakes in idioms or grammar, as well as a tendency to cliche. That's a gross over-generalization I'm sure, but it's a definite tendency in the few books I've read by professional journalists. I wonder if anyone else agrees with me? That's a nicely varied list of favorite nonfic topics. I'm interested in this combo of conversational/journalist-y narrative style and self-help subjects — are there any that come to mind that you think fit both preferences really well? Lory — Great point about journalistic style. A couple of years ago, I abandoned a book by a journalist that contained factual errors and some glibness, because it was driving me nuts. I'm looking for writing that's punchy and original. looloolooweez — What a great question! One of the best recent examples I've read is "The Power of Habit" by Charles Duhugg. I have s strong preference for a more casual voice as well, and I dig that cover, although I would have assumed that it's a man type story, which I am still pushing myself to be more open minded with. I can't wait to read the Ervin book…I'm planning to listen to it on audio as soon as I finish my current book. And, I assume since you love true disaster nonfiction that you've read Five Days at Memorial, but read it immediately if you haven't! I'm almost finished with it and it's fantastic. I agree with you on the Presidents. I have read a fair number of Presidential biographies and I feel that I have gotten a lot out of them. I am thinking that I will soon read some more. I prefer narrative nonfiction, too, and generally enjoy books by journalists. The presidents and true disaster are subject that always catch my attention! Voice is really important, it's hard to keep engaged with a dull voice even in the most fascinating subjects, but a great one can make a dull subject entirely enjoyable. Toady — The narrative voice is so important! Whenever I encounter a book with a stuffy tone, I'm reminded of how much I prefer conversational. Sarah — Five Days at Memorial — just added it to my TBR. Thanks for the recommendation! Brian — Presidential biographies are one of my favorite categories. Even (especially?) biographies of the lesser-known presidents. JoAnn — I'm right there with you! Ellie — Totally agree! I've read — and really enjoyed — books on topics I would never have imagined I'd want to read. But once I get a sense of the writing style, that can be enough.